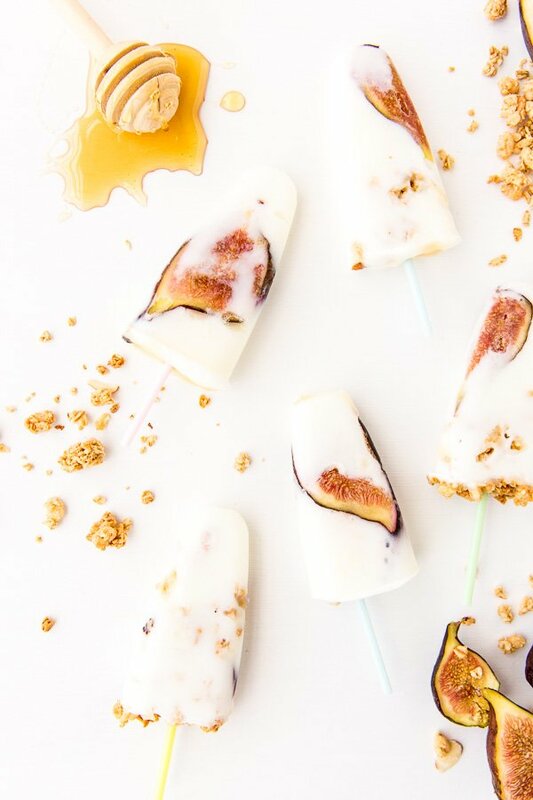 I made these yogurt and granola fig pops in just a couple of minutes, popped them in the freezer, and had breakfast for the whole week. Quickest breakfast ever! And if you’re not a fig fan (I grab them whenever I see them at Whole Food because its seems like the seasons for figs are so short), you can easily switch out the figs for your favorite fruit…strawberries, nectarines, blueberries, etc. 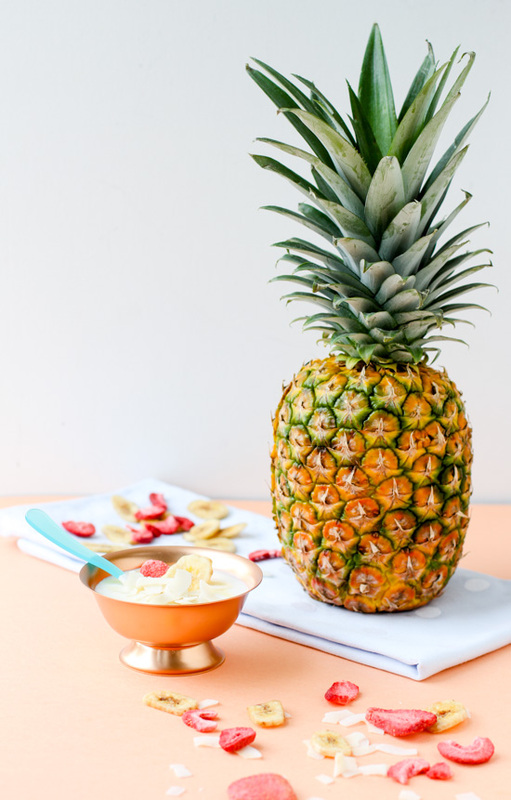 *Keep in mind that the sweetness of things tends to dull a bit when frozen, so error on the side of slightly too sweet when tasting before freezing, as opposed to slightly not set enough, if that makes sense. 1. Start by washing and drying the figs, then slicing them into thin(ish) slices. Set aside. 2. Whisk together honey and yogurt until combined. 3. 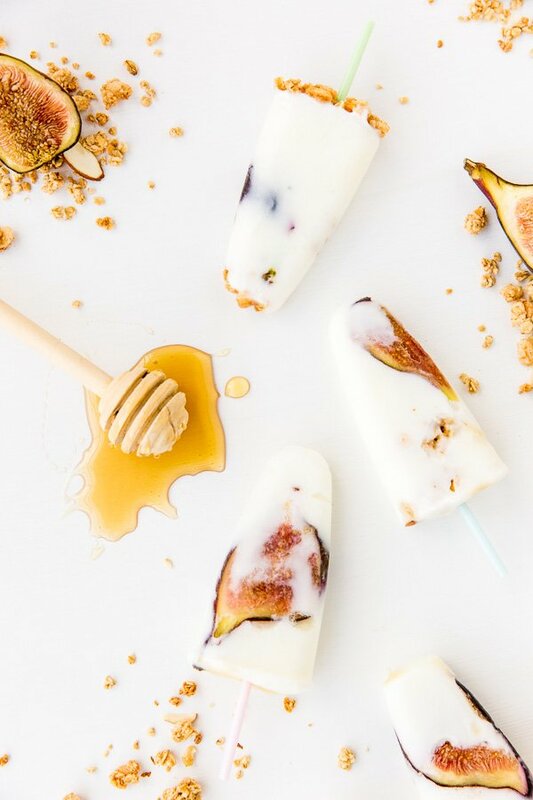 Start by adding a slice of fig to each popsicle mold, then add 1-2 spoonfuls of yogurt and honey mixture. 4. Next, add a layer of granola. Followed by more yogurt mixture, another slice of fig, etc. Continue this process until each mold is filled. 5. 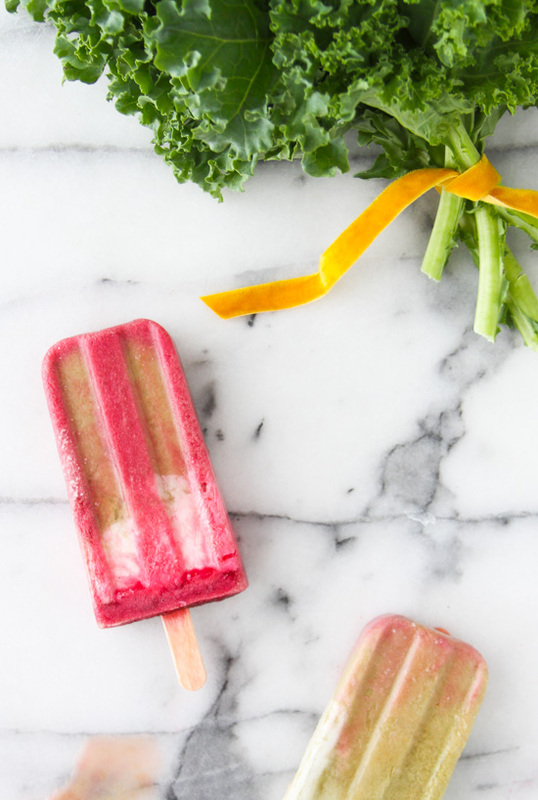 Add popsicle sticks (because yogurt is a semi solid, you won’t have to wait until the popsicles are partially frozen to add them in), then freeze for 3-4 hours or until full frozen. 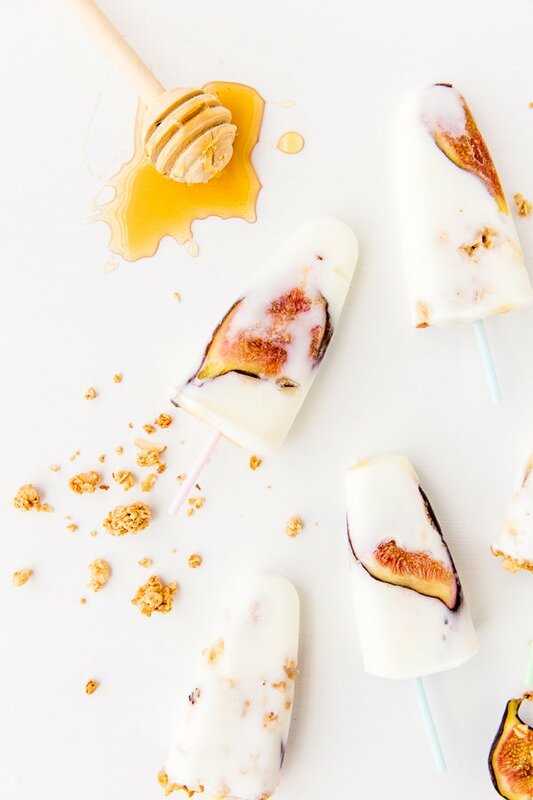 I love how simple these are to make, but I especially love how easy they are to eat, since they’re on a stick and all. I grab one when I’m headed out the door for work and eat it on my drive in. Doesn’t get any easier than that! What do you like to eat for breakfast? Think you’ll try this on-the-go recipe? These look so good! And now I can finally live my dream of eating ice cream for breakfast. 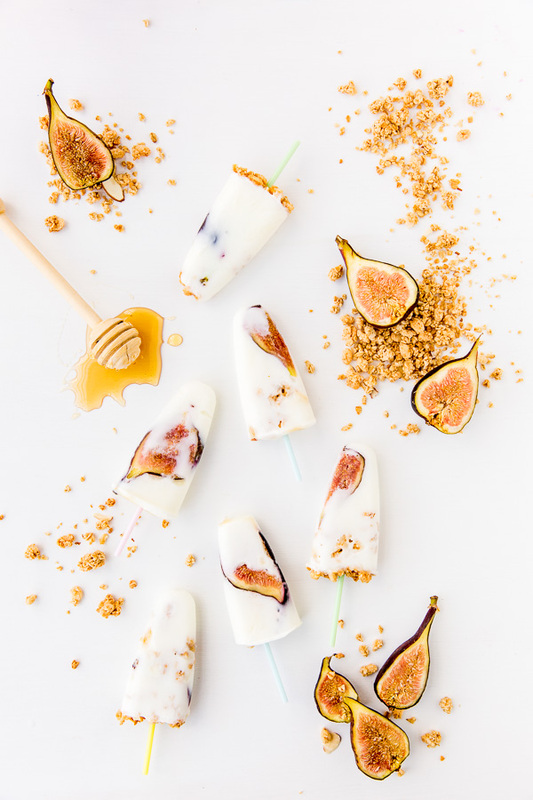 This looks and sounds so super delicious, and I totally love figs. Definitely going to try this! That sounds so yummy! I absolutely love figs, but I like the idea of switching out the fruits too. Will try this out as soon as I go grocery shopping! Totally Kiersten. It will work for any fruit. Yum! this is awesome! i’m gonna try it! do you put them in a freezer and only wait for 3-4 hours or do you mix them during this time? don’t you have icicles inside after freezing? 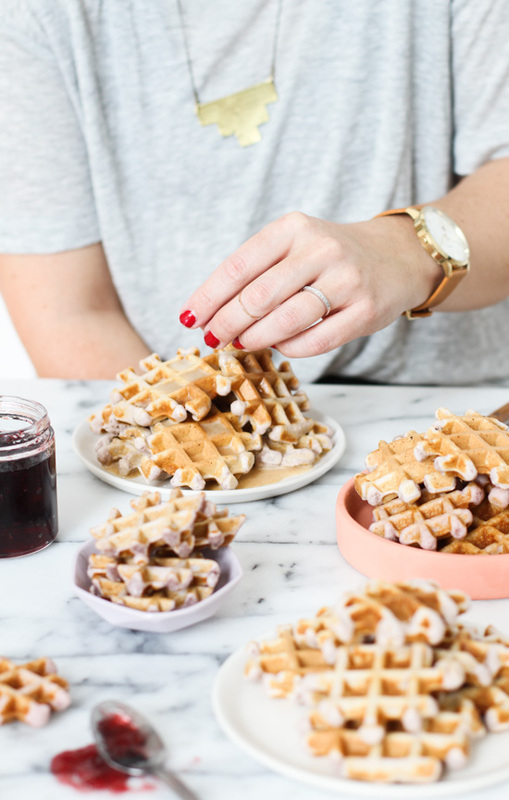 10 make ahead breakfast recipes that make school mornings easier. These look so good! I can’t wait to try them 🙂 maybe I can substitute the honey for maple syrup and the yogurt for coconut cream to make it vegan!